The global NGS informatics and clinical genomics market is composed of tools, software solutions and services catering for the data analysis needs of the NGS market. Despite the technological advancement in the field of next generation sequencing, analysing huge datasets coming out of sequencers remains a major challenge in the industry that prevents the NGS technology to be used as a routine technique. There are three significant forms of NGS data analysis: primary, secondary, and tertiary analysis. The software platforms or tools catering for NGS data analysis either perform primary, secondary, and tertiary data analysis. However, there are software packages available which provide end to end (primary to tertiary) data analysis solutions. Some of the major analysis performed by NGS software tools include image acquisition, quality control, base calling, alignment to a reference genome, variant calling, and biological interpretation. In the primary analysis stage, the raw data is converted to sequence data wherein the base pairs in a genome are typically identified by laser excitation or fluorescence detection. A primary data analysis tool is a part of sequencing instruments and is typically installed on the local hardware systems supporting sequencing instruments. The resultant of this data analysis stage is usually a FASTQ file (string of characters: A, C, T, G, and N). In the secondary data analysis stage, reads generated (short genomic sequences) are aligned against a reference genome. Once the file is aligned, a BAM file is generated which is subject to further refinement steps such as flagging or filtering of duplicate reads, recalibration of quality scores (in the first stage), and variant calling with the help of various statistical modelling techniques. The variant calling step determines the point of difference between the sample and the reference genome. The last and the most complex and time-consuming phase of NGS data analysis is tertiary analysis. This stage aims at identifying which variants in a sample are benign, pathogenic, or VUS (variant of unknown clinical significance). The complexity of the stage can be understood from the fact that one human exome may have approximately 3.2 million variants and interpretation of each of the variants become a daunting task for the industry. The market report is well-designed to provide an all-inclusive field of vision about the global NGS informatics and clinical genomics market in terms of various factors, such as recent trends, technological advancements, competitive landscape, and regulatory environment of the market. The scope of this report is centred upon conducting a detailed study of the solutions allied with the global NGS informatics and clinical genomics market. The market has been segmented into “Technology” ‘Products’, ‘End Users’, and ‘Region’. The report presents the reader with an opportunity to unlock comprehensive insights with respect to the market and helps in forming well-informed strategic decisions. The research uncovers some of the substantial parameters that must be taken into consideration before entering the market. 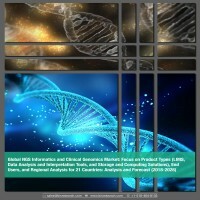 This research report aims at answering various aspects of the global NGS informatics and clinical genomics market with the help of the key factors driving the market, challenges, and threats that can possibly inhibit the overall growth of the market and the current investment opportunities that are going to shape the future trajectory of the market expansion. The study considers the growth-share matrix model for a comprehensive study of the global NGS informatics and clinical genomics market and assesses the factors governing the same. • What are the major market drivers, challenges, and opportunities in the global NGS informatics and clinical genomics market? • What was the market value of the leading segments and sub-segments of the global NGS informatics and clinical genomics market in 2017? • How will each segment of the global NGS informatics and clinical genomics market grow during the forecast period, and what will be the revenue generated by each of the segments by the end of 2028? • How will the industry evolve during the forecast period 2018-2028? • What are the potential end users of the global NGS informatics and clinical genomics market? How NGS informatics and clinical genomics software platforms will boost the performance of different end users? • Who are the key players in the global NGS informatics and clinical genomics market, and what are their contributions? • What is the scope of expansion by the key players of the global NGS informatics and clinical genomics market in Asia-Pacific, Europe, and Middle East? 1.3 Role of NGS Informatics in Precision Medicine? 11.25.2 Amazon Web Services, Inc.
11.25.8 Seven Bridges Genomics Inc. Figure 8.5 First stage of NGS data analysis: Primary analysis: Base calling. Figure 8.6 Second Stage of NGS Data Analysis: Secondary analysis: Read Alignment and Variant Calling. In the last two decades, there have been significant strides made in the field of genomics and the field has so evolved that it is constantly being pushed to work for the facilitation of precision medicine (targeted medicine). The major factors that facilitate large scale research projects aimed at genome sequencing include the falling cost of genome sequencing. Also, the declining cost is catalysing the adoption of genome sequencing in multiple end user segments such as pharmaceutical companies (during clinical trials and drug discovery), hospitals, and speciality clinics. However, as the adoption increases, the amount of data generated from NGS machines also surges exponentially. For successfully understanding hidden patterns underneath this data, there is a strong need for analytical tools which can efficiently interpret, report, and help the stakeholders in the industry to make crucial clinical decisions. In this regard, there is already an abundance of primary and secondary tools, which are about to be commoditized with the standardization of pipelines. However, analysis and interpretation are two significant aspects to this market. While primary and secondary tools (which performs analysis of NGS data) are in abundance, there is a dearth of tertiary analysis tools that caters to the interpretation and reporting of NGS data. Moreover, the price has dropped significantly for sequencing a genome, but the cost of analysing and interpreting NGS data remains on a rise. Due to the increasing awareness about the medical importance of precision medicine, there has been a flurry of business activities in the NGS informatics and clinical genomics market. Companies are putting significant efforts in the development of the technology for precision medicine applications and have demonstrated an inclination toward partnerships and collaborations, with other firms, mostly software providers with expertise and healthcare institutions. With 54% share in all the business strategies adopted by companies, partnership and collaborations seem to be the strategy of choice for companies to enter into this market. Companies are focusing on novel software product development and launch to secure early mover’s advantage in the market with this strategy accounting for 18% of the total strategies employed. Furthermore, the NGS informatics and clinical genomics market is witnessing a steep rise in the launch of new informatics tools. The average frequency of product launched in this market is 10-12 a year. The products available in the global NGS informatics and clinical genomics market encompasses a wide range of software products, platforms and services used for computing, and analysing, interpretation, and storing of NGS data. The market also consists of on-premise as well as cloud-based solutions offering a wide range of primary, secondary, and tertiary (analysis and reporting) of NGS generated data. As of 2018, NGS informatics services is the largest product segment in this market. These services are often provided by NGS instrument providers such as Illumina and ThermoFisher Scientific, among others. With the maturity of the market, the demand for these services will surge due to shift in the end user preference for seamless end-to-end genomic solutions at competitive prices. The NGS informatics and clinical genomics market has five major end users namely: academic research institutes, biopharmaceutical companies, diagnostic companies, government agencies, and hospitals and clinics. These end users group adopt NGS informatics solutions for a wide range of purposes. As of 2017, the academics and research institutes served as the leading end user segment of the market holding a share of approximately 41% of the overall market. However, biopharmaceutical companies followed by hospitals and clinics are expected to be the leading end-user segments in this market growing with a CAGR of 22.02% and 21.66% respectively, during the forecast period. The reason for this high growth is primarily due to multiple factors such as rising popularity of NGS-based tests among the healthcare organizations, increasing use of NGS tests in drug discovery, and clinical trial, among others. The global NGS informatics and clinical genomics market encompasses major regions such as North America, Europe, Asia-Pacific, Middle East and Africa, and Rest-of-the-World (RoW). North America is the leading region in the NGS informatics and clinical genomics market accounting for approximately 45.45% and has an estimated value of $380.0 million (as of 2017). The U.S. is the clear regional leader in the North America market with an estimated value of $361.0 million. The major reason for the growth in this region is the rapidly increasing number of genomics projects funded by government which will be providing millions of dollars for the next couple of years to have thousands of patient genomes sequenced. The dynamics of the overall market depicts that the NGS informatics and clinical genomics space offers huge profitability to investors willing to enter the market. The year 2017 witnessed numerous series of fundings from investors to companies working on data management, analysis, and interpretation of NGS data. For example, companies such as Genoox have been potentially funded ($6 million investment) by Inimiti Capital and Glilot Capital Partners (two Israeli venture capital firms) for developing a platform for interpretation of NGS data through a search engine. A plethora of companies are being invested in for their innovations toward data interpretation and visualization. In the years to come, the scope and scale of sequencing projects will further evolve as the throughput per sample will significantly surge and the cost of sequencing further plummets.